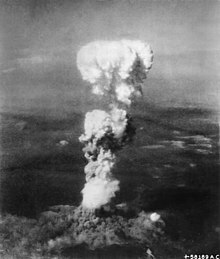 The mushroom clood produced bi the Atomic bombin o Hiroshima during Warld War II. Tot war is warfare that includes ony an aw ceevilian-associatit resources an infrastructur as legitimate militar targets, mobilises aw of the resoorces o society tae ficht the war, an gies priority tae warfare ower non-combatant needs. This page wis last eeditit on 4 Februar 2019, at 17:43.